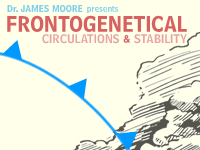 “Frontogenetical Circulations and Stability” is a Webcast by Dr. James T. Moore that focuses on an overview of different stability types, including convective, potential, inertial, conditional and symmetric, the concept of frontogenesis and associated circulations. The webcast concludes with a discussion of the role of stability in determining the character of frontogenetical circulations. Although pretty difficult without the proper dynamical treatment from classes or research, it is nonetheless informative and interesting. I learned a lot just from going through this module. 1. Understand various types of stability, including convective, potential, inertial, conditional and symmetric, and recognize when they might occur for a given forecast situation. 2. Understand the concept of frontogenesis/frontolysis and associated circulations that result. 3. Recognize the impact of stability on the character of frontal circulations. Conditional instability, convective instability, symmetric instability, potential instability, symmetric instability, frontogenesis, kinematic frontogenesis, shear, confluence, tilting, diabatic heating, deformation, shearing deformation, stretching deformation, kinematic frontogenesis, thermally direct circulation, thermally indirect circulation, Sawyer-Eliassen equation, frontogenesis equation.